You may recall seeing sportscaster Bob Costas fighting through watery, reddish eyes as he hosted the 2014 Winter Olympics in Sochi—and no those weren’t tears of joy. The prime-time NBC star was actually suffering from pink eye, or inflammation of the conjunctiva, a thin membrane that coats the surface of the eye and eyelid. 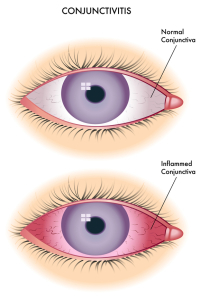 Also called conjunctivitis, pink eye is quite common and is highly contagious if you’re not careful. Because of the high risk of spreading conjunctivitis, we created a short overview of pink eye along with a few tips on how you can protect yourself and those around you. Viral and bacterial conjunctivitis are perhaps the most common types of pink eye. Sharing a towel, improper hand washing, or even direct skin contact with an infected person can contribute to the spread of pink eye. Allergic conjunctivitis, on the other hand, is not contagious and results when an allergen, such as pollen, triggers more histamine in the body. This leads to inflammation and can sometimes result in pink eye. You can also get chemical or toxic conjunctivitis when a foreign substance gets into your eyes, such as the chlorine used in swimming pools. 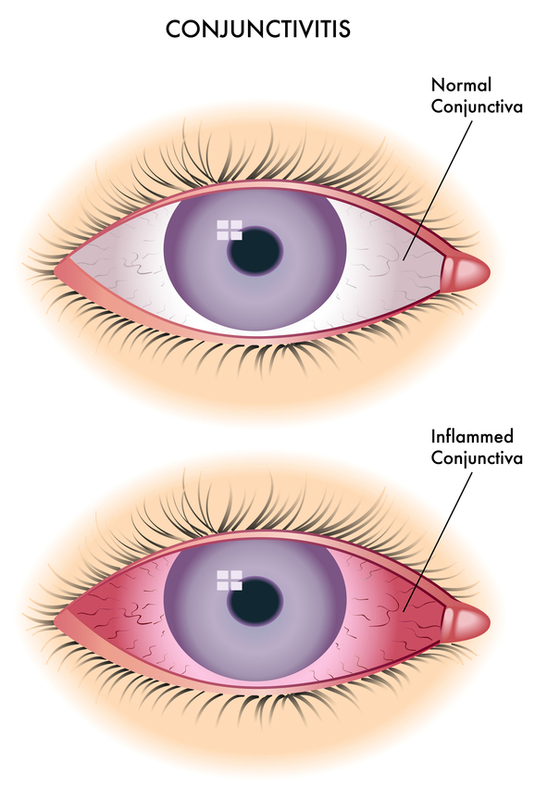 Smoke, fumes, and other chemicals can also cause conjunctivitis. In many cases, pink eye will go away naturally without needing medical treatment or antibiotics. You can, however, use artificial tears and over-the-counter ointments in an effort to alleviate pink eye symptoms. If you’re exposed to a chemical irritant, it’s a good idea to rinse your eyes thoroughly with warm water and follow up with your doctor immediately. For many people, pink eye is nothing more than a mild irritation that causes temporary discomfort or pain. However, the complications of pink eye can become severe enough to warrant a trip to the emergency room. If you or a loved one have conjunctivitis, make sure you seek medical treatment if your symptoms don’t improve with seven to ten days. Pink eye in young children, or neonatal conjunctivitis, is very dangerous, and may lead to severe eye problems in the future, not to mention other infections of the body. Infants are especially vulnerable to pink eye if the mother has a preexisting infection, such as chlamydia, gonorrhea, or genital or oral herpes. 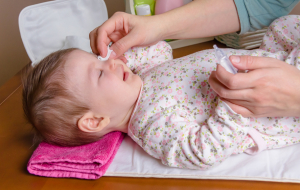 Besides bacterial and viral conjunctivitis, a newborn can also get pink eye from blocked tear ducts as well as eye drop treatments, which are commonly used after birth to thwart infection. To reduce the risk of neonatal conjunctivitis, doctors are encouraging pregnant mothers to get tested and or treated for sexually transmitted diseases and other infections. Additionally, if your infant shows signs of conjunctivitis after childbirth, be sure to seek medical treatment immediately to avoid the risk of long-term damage. At Elite Care 24 Hour Emergency, we are fully staffed with board-certified physicians and offer the same medical expertise as a hospital emergency room. If you need fast and reliable treatment near the Coppell, Lewisville or The Colony area, Elite Care is your trusted source for emergency services.